When Princess Sincerity receives an invitation from Prince Noble to a royal ball, she knows she has to find something extra special to wear. She also knows that the dress will be a reflection of who she is on the inside. 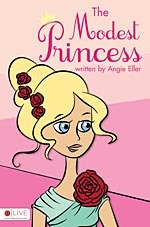 Will she be able to find the perfect gown, and will Prince Noble notice Princess Sincerity and love her for who she is? What a SWEET book! It's darling, daring and fitting for the youngest daughters and even for young women. The book reflects the value of modesty that is not seen much in the world today. What I loved about it is that it's not written in a "preachy" tone but rather a hip way that makes any girl reading it wish she were "The Modest Princess." was both respectable and glam. She'd like to join the fam!"